How to pack Export cargo? Importance of proper packing in International Trade. After reading this article, you can also read How to get export order from foreign buyers? I am going to explain about the importance of proper packing in export and import trade with some levels of example. While reading, you may feel very simple on the subject. However, after completing reading of this article, I hope you will have a clear idea about the subject – The importance of Packing in Export and Import trade. Let us take examples of some business men from street hawkers to higher level in domestic trade. Most of the products of street hawker are small in size and weight. Here he packs his material in a small cover and delivers to the buyer. Either buyer may keep the same in a bigger bag he carries or he just carries in his hand, as his distance of travel to carry such small items is very less. a. Only two times handling happens -While loading and unloading. b. You or your staff’s direct supervision is involved while loading and unloading. c. The buyer is keen after unloading chairs in checking whether any damage is there, as the time required to check is less as there are only two chairs. d. The distance to reach the material is very less. e. If any damage, immediately the problem can be solved, as you and your buyer may be either known each other or can be known each other because of geographical location of both of you. Now you are an exporter of a consignment to send to overseas. 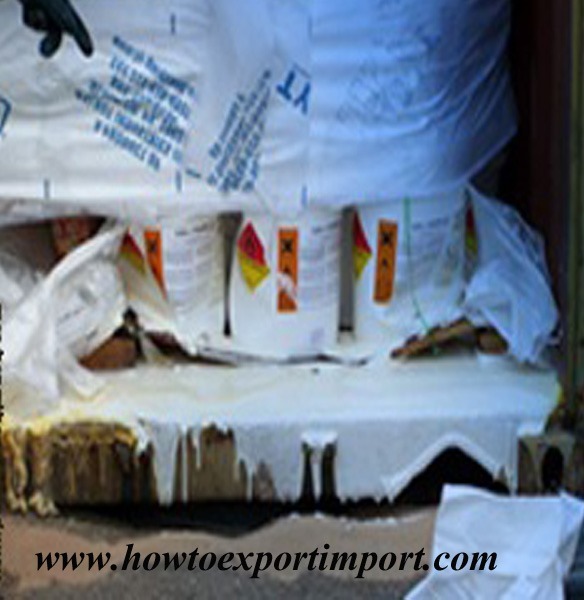 Here the importance of packing in Export Import trade. Now in exports, since the distance between exporter and importer is very far, the cargo is moved thousands of miles away from its origin. If the cargo is less container load, (Lesser than a container), chances are there to transship your cargo from different locations. So many times, the goods will be moved. For example, you need to move a cargo from New York to China. The cargo will be sent by truck to nearest CFS of your factory, unloading to warehouse, stuffing in to container, moving to New York, again unload at port, loading to container, moving to on board in to ship, unloading to transshipment point if any, again sorting, loading to container, vessel sailing Singapore, unloading in CFS, moving for inspection procedures, loading to truck after customs clearance. Apart from the above mentioned movements, in each warehousing point, there are chances of further movement of your goods due to re-arranging the slots, movements for survey, inspection etc. If poor packing of goods, there are chances of damage, while handling with forklift, or other equipments even though proper supervision is available. The quantity of goods will be more in export consignments, compared to local sales and physical attention of buyer or seller is impossible. The distance of transit is more and damage can happened in transit, if poor packing. 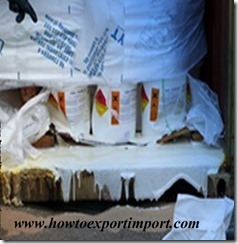 Compared to local sales, if damaged due to poor packing, claiming insurance is a lengthy procedures in international trade. I hope, I could satisfy with this article about the importance of packing in export trade. Do you wish to share your experience and knowledge about this subject – Importance of Packing in export import trade? Write below your comments about importance of Packing in international trade. Viral Thacker: On 15 January 2014 satisfied after reading the article . . . .
Gandhi Jitendra: On 05 February 2014 Even when the quality of items exported may be good, the quality of packaging material of articles from India is usually horrible. The soft card board exporters use is mostly in tattered condition by the time the container is opened at the destination. Also stuffing used [rice/grass/shredded paper] turnout to be a nuisance as the receiving countries may have less callous attitude towards their environment. The shabby condition of packaging reflects on the quality of items, often giving bad name to the exports from India even when the actual goods may be of better quality compared to fancily packed items from elsewhere! I sincerely wish those in packaging industry - particularly in 'Manila Board' and Corrugated Cartons' section - learn basics of box-stiffness and stacking weight calculations. Saravanan Mani: On 16 February 2015 I am a beginner to export business and have no big investment. I personally thank and appreciate your service which is very inspirational and useful to entrepreneurs like me.I am planning to obtain enquiries from importers through our paid account in alibaba for my company. I have the following doubts to proceed further. 1. I have approached my bank manager to know about procedure of availing packing credit(PC). Alternatively he said i need collateral security to avail PC. But i am not in a position to have any collateral security. Is it possible to get packaging credit from a govt bank on an L/C at sight without any collateral security and all? If possible, how to avail it? 2. How to quote payment terms for fresh vegetables like shallots, green chilli, drumstick etc? Ex: 50 % TT & 50% L/C, 100% TT etc. Please advise me to move on sir. Krish kumar: On 16 February 2015 I request you to kindly help me for getting the following details. 1. where to get model or sample(standard) pro forma invoice and main invoice with terms and conditions ( which are normally send by existing export companies in india) to the buyers against the enquiry. Admin: On 16 February 2015 Saravanan Mani, Some of the banks provide packing credit against Letter of Credit at Sight, without collateral security. Read more posts in this website to know process of exportation with payment terms and delivery terms. Gayatri Sharma : On 13 October 2015 First of all I would like to congratulate you on your endeavor of spreading valuable knowledge through your blog! I have just started considering export as a business with my husband and I have some doubts. I am hoping you would help me out and guide me right. I have contacted someone know who sells hand sanitizers and Ultrasound gels. He is our costumer (my father in law has a packaging business). He has offered to buy his products which we can further export as traders. So, now I have these few questions in mind. I did not find any articles related to the following. If they do exist, can you please send me the links or would be even better if you could please answer these doubts. :) 1. Should we use our own brand name on his product labels or let them be as they is? He himself exports his products too. Will it be a good idea if we change the brand name altogether and create our own website that would display HIS products but with our name? 2. Also, can we use HIS lab photos on our website? Will that be ethical as a trader when we are out there exporting? 3. Do we need a license for exporting his products, as a trader? 4. Is there a way to search for license details for a particular product on your website? (hand sanitizer in this case) and all export info related to that? : bhaskar ray : On 17 August 2016 I want to start export business and I choose an exportable item Hand-Loom Scarf. Is it possible? Can you help me any other exportable item for export business? I have export licence in my invidual name. If possible pls. help me. Radha Kolli : On 21 November 2016 my mom has setup a business in Andhra Pradesh and wanted to help her setup the right path to export goods to India.Here is where we are: Firm name established with Sales Tax Registration Number Trying to apply for the IEC code online (working on the Digital signature) I am looking for good Export and Customs agents in Hyderabad who can help me with this.